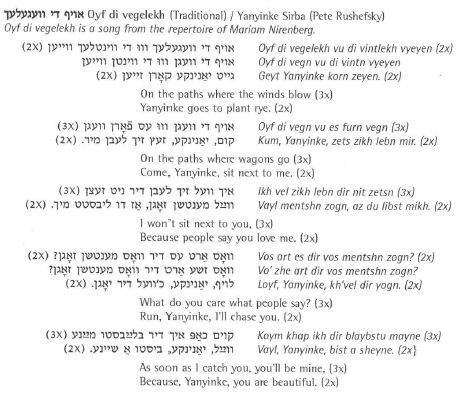 The song Du vint du shtifer, (You wind, you prankster) was learned by Leo Summergrad in the Bronx Mitl Shule of the IWO (International Worker’s Order) in either 1938, 1939, or 1940. The recording presented here was made in the 1950’s. Summergrad’s music teachers would have been either Vladimir Heifetz (1893 – 1970) or Irving R. Korenman, both well-known composers associated with the Jewish left. More on these composers can be found in the papers of Vladimir Heifetz at YIVO. The author and composer of “Du vint du shtifer” will probably also be found in Heifetz’s papers. un umetum hostu a lid gehert. un bahaltene soydes fun yam. fun mutikayt vos veyst keyn tsam. Zol mit undz itser zingen on shrek. un zukhstu nor, gefinst dayn veg. ale lider fun friling geshpreyt. zikh hoybn zoln fis far freyd. And everywhere you heard a song. Of a spirit that has no bounds. Should sing with us, without fear. And if you desire, you’ll succeed. And if you seek, you will find your way. All the songs of Spring, combined. And feet shall rise with joy.